"The room has to be comfortable; the house has to look habitable. " Adolf Loos (10 December 1870 – 23 August 1933) was one of the most important and influential Austrian and Czechoslovakian architects of European Modern architecture. In his essay "Ornament and Crime" he repudiated the florid style of the Vienna Secession, the Austrian version of Art Nouveau. In this and many other essays he contributed to the elaboration of a body of theory and criticism of Modernism in architecture. Born in 1870 in Bruenn (Brno), Moravia, to an ethnically German family, Loos was nine when his father, a stonemason, died. He completed technical school in Liberec, Czech Republic, which is now Technical University Liberec (a plaque located in front of Pavilion H commemorates this) and later studied at Dresden Technical University before moving to Vienna. Loos stayed in America for three years, where he had an uncle living in Philadelphia. 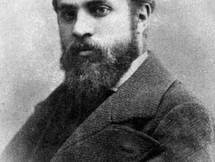 He visited the 1893 Columbian Exposition in Chicago, and appreciated the work of Louis Henri Sullivan. He visited St. Louis and did odd jobs in New York. Loos returned to Vienna in 1896 a man of taste and intellectual refinement, immediately entering the Viennese intelligentsia. His friends subsequently included Ludwig Wittgenstein, Arnold Schönberg, Peter Altenberg and Karl Kraus. He quickly established himself as the preferred architect of Vienna’s cultured bourgeoisie. Searching for marble in 1904 he first visited the island of Skyros and was confrontated with the cubic architecture of the Greek islands. Diagnosed with cancer in 1918, his stomach, appendix and part of his intestine were removed. For the rest of his life he could only digest ham and cream. His personal life was tumultuous. He had three wifes. Loos married his third wife, writer and photographer Claire Beck, in 1929. She was the daughter of his clients Otto and Olga Beck, and thirty-five years his junior. They were divorced on April 30, 1932. Following their divorce, Claire Beck Loos wrote Adolf Loos Privat, a literary work of snapshot-like vignettes about Loos’ character, habits and sayings, which was published by the Johannes-Presse in Vienna in 1936. The book was intended to raise funds for Adolf Loos’ tomb. He died in Kalksburg near Vienna. Following his death in 1933, Loos’ body was moved to Vienna’s Zentralfriedhof to rest among the great artists and musicians of the city – including Arnold Schoenberg, Peter Altenberg, and Karl Kraus, all some of Loos’ closest friends and associates. To understand fully Loos’s radical, innovative outlook on life - his admiration for the classical tradition, his passion for all aspects of design, lifestyle and taste, and the breadth of his ideas - it is essential to read his own collected writings, which were published by MIT press in English as Spoken into the Void in 1982. 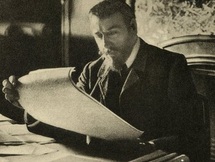 In his essays, Loos was fond of using the provocative catchphrase and has become noted for one particular essay/manifesto entitled Ornament and Crime, written in 1908, in which he repudiated the florid style of the Vienna Secession, the Austrian version of Art Nouveau. In this essay, he explored the idea that the progress of culture is associated with the deletion of ornament from everyday objects, and that it was therefore a crime to force craftsmen or builders to waste their time on ornamentation that served to hasten the time when an object would become obsolete. Perhaps surprisingly, Loos's own architectural work is often elaborately decorated. The visual distinction is not between complicated and simple, but between "organic" and superfluous decoration. He prefigures the Brutalist movement that spreads from the 1950s to the mid 1970s. Loos was also interested in the decorative arts, collecting sterling silver and high quality leather goods, which he noted for their plain yet luxurious appeal. 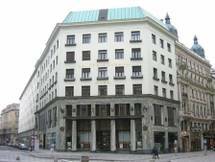 He also enjoyed fashion and men's clothing, designing the famed Kníže of Vienna, a haberdashery. Loos, through his writings and his groundbreaking projects in Vienna and the major cities of the Czech Republic, was able to influence other architects and designers. His careful selection of materials and use of 'Raumplan' - the considered ordering and size of interior spaces based on function — are still admired today. Loos's buildings were rigorous examples of austere beauty, ranging from conventional country cottages to planar compositions for storefronts and residences.